What does James Bond from Her Majesty’s Secret Service have in common with Don Draper from AMC’s Mad Men series? Other than the fact that they’re both fictional characters, they are both men with perfect style, including impeccable taste in men’s dress shirts. Men who care about dressing well may appear to be careful about everything from shoes to suits, but their real obsession is with dress shirts. While women might desire a wide selection of shoes, sartorial men want a wide selection of dress shirts. While it might seem that there is more to say about picking good running shoes than to pick a dress shirt, a stylish man evaluates many details that other men miss entirely. He considers the stitching on the buttons. He considers the weight of the fabric. He considers how well the collar holds up when wearing a jacket. He also considers whether it’s merely a fashionable dress shirt or a performance dress shirt. While a trendy shirt will look good at a sedentary office job, a performance shirt will stand up to frequent movement and sweat when worn in an active job. For example, a sales trainer giving an enthusiastic presentation to a large group would be better off with a performance dress shirt. Choosing a dress shirt is much more complicated than most people imagine, and the reason why it matters is because it can make a huge difference to a man’s career. For instance, it can make a difference when talking to a client, making a presentation, attending a social gathering, or going to a job interview. Men who dress for success understand that grabbing a shirt off the rack and hoping things will work out is not the best way to create a favorable impression. It’s important to spend time finding the best color, fit and quality. Color. Colors depend on the job or activity. An executive should not wear the same color at work as he will when meeting his colleagues for dinner. The choice of color must match the environment or the occasion. While off-white or light blue might look great in the office, brighter, bolder colors will help project a lively image at a social gathering. Patterns. Like colors, these depend on the occasion. While solid colors can work for formal occasions, a person will look overdressed at a casual party. 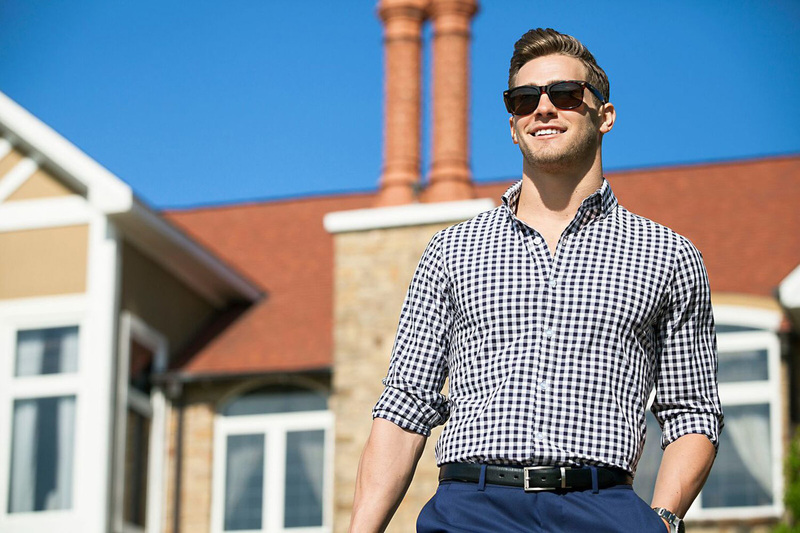 Subtle patterns, stripes, and plaids work better for business-casual type of situations. Fit. When it comes to fit, there are three choices. You can wear a slim fit, athletic fit, or broad fit. The right fit depends on your body type. A slim fit is tighter around the chest and the sides, without much fabric at the back. It’s ideal for an ectomorph, someone who has a flat chest, small shoulders, and lean muscle mass. An athletic fit has more fabric around the chest and tapers toward the waist. It’s ideal for a mesomorph, someone who is athletic, with well-defined muscles and a rectangular shaped body. Finally, a broad fit has a customary amount of fabric, It’s ideal for an endomorph, some who is stocky and has a rounder physique. Fibers. The best fibers are linen and cotton. Linen is a strong fiber and has a crisper look than cotton. Since it retains heat, it’s best worn during the cooler seasons, like fall and winter. Cotton is also a strong fiber and it can be worn in any season. It’s soft and is suitable for work and formal settings. Weave. A weave is the thickness and tightness of the thread. These are classified as broadcloth, pinpoint, oxford, and twill. Since these are hard to detect with the naked eye, you will have to ask the salesperson or look for any product descriptions. Broadcloth is best for executive functions, high-level business meetings. Pinpoint is best for formal social occasions like a dinner. Oxford is best for general business wear or a formal gathering. And finally, twill works well for formal and informal occasions because while the shirts are soft, they are less likely to wrinkle because they have a diagonal ribbed pattern. Ties. When wearing ties, it’s best to choose a light blue, gray, or white shirt. These solid shirt colors work well with almost any tie, whether or not it’s a patterned or solid color tie. By contrast, the best way to advertise that you have no idea how to dress is to wear a tie with a patterned shirt. Collars. The two primary choices when it comes to collars are point and spread collars. The point collar is considered the default standard, and the edge of the collar points at an angle of 60 degrees. The spread collar is considered more youthful and carefree, and the edge of the collar points at an angle of 90 degrees. While many men distinguish between a quality dress shirt by the brand name or the price tag, it can still be difficult to decide between two quality brand names at similar price points. Using this 7 point checklist will make it easier to pick the best shirts.